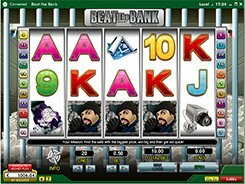 Beat the Bank is a bank heist-themed slot with 5 reels and 20 paylines. 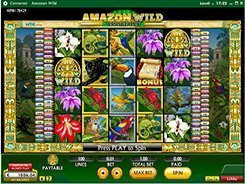 The slot features a wild, a scatter, free spins, a bonus game and a 5000-coin jackpot. 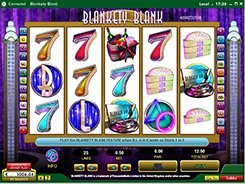 The slot accepts a single coin per line, and a coin denomination may be changed from $0.05 to $10, thus a total bet goes as high as $200 per spin. Along with classic playing card values from 9 to Ace, there are some themed icons like a security camera, diamonds, a thief, a policeman, etc. The Thief symbol has two bonus functions when landed on the reels; first, it serves as a wild and substitutes for other symbols; second, it triggers 15 free spins with all wins trebled, once it lands on reels 2, 3 and 4 at a time. Besides, the slot features a scatter that is the Safe symbol. Three or more scattered Safes activate the Beat the Bank feature where you may win a prize of x1024 times a total bet. In the bonus game you will be presented with two safes, and your task is to crack open the correct safe and double your total bet placed in the triggering round. You continue to pick until the safe of your choice fails to open. PLAY FOR REAL MONEY!